Extracts from honeybush (Cyclopia spp.) are known for their anti-oxidant, anti-mutagenic, anti-carcinogenic and phytoestrogenic activities. This invention shows that it also has anti-fungal and anti-bacterial activities. Honeybush extracts strongly induced biomass production in the filamentous fungi, suggesting that it could be used as a growth stimulant, perhaps to enhance growth of Aspergilus. niger during the production of industrially important compounds. Honeybush tea extracts have a bacteriostatic effect on the bacterial species Escherichia coli, Propionibacterium acnes, Pseudomonas aeruginosa and Staphylococcus aureus, while a fungistatic effect was shown against growth of Candida albicans, which is the causative agent of common yeast infections in humans. Additionally, the ability of Botrytis cinerea, a pathogenic plant fungus, to cause necrosis in white grape berries was inhibited by 55% in the presence of the honeybush extract. Pharmaceutical companies looking for “natural’” antimicrobial agents to be incorporated into ointments, lotions, soaps, etc. Activity against Streptococcus mutants also suggests an application in oral hygiene. Water or organic solvent-based extracts in the range of 10 mg/ml to 50 mg/ml of Cyclopia subternata and Cyclopia genistoides (and possibly also other Cyclopia sp.) 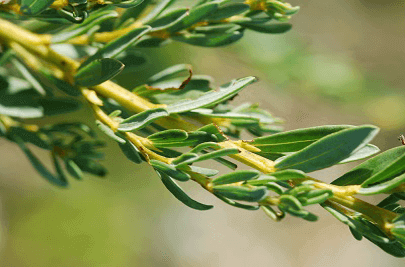 leaves can be used alone or in combination with extracts from Aspalathus linearis (redbush) to inhibit the growth of selected micro-organisms. Sensitive organisms include Escherichia coli; Salmonella enterica; Vibrio spp. ; Staphylococcus aureus; Pseudomonas aeruginosa; Propionibacterium acnes; Enterococcus feacalis; Streptococcus mutans; Listeria monocytogenes and Candida albicans. Extracts used for the evaluation were prepared by the ARC (C. genistoides) or provided by Raps GmbH (A. linearis and C.